All Jamie wants is to spend some time alone at the beach and finish her art project in the sand. But everyone around keeps asking her pesky questions she doesn’t know how to answer: what are you making? Aren’t you clever? Jamie does her best to tune it all out and focus on her creation…until she finds a like-minded friend. 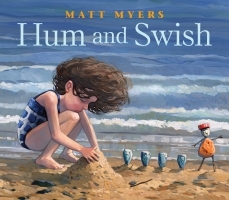 Widely respected artist Matt Myers makes his debut as an author in this story that celebrates creativity, introversion, and the beauty of a little peace and quiet.